The most complex joint in the body is also the most vulnerable. Spine Scan and Trigenics can alleviate and prevent both chronic and short-term shoulder pain. At Spine Scan Chiropractic, Perth Chiropractor Dr Adam Rocchi sees many patients with shoulder and arm discomfort and restricted joint mobility. Although many have similar symptoms, careful diagnosis regarding the cause in each case is necessary in order to determine the best course of treatment. The shoulder is a very complex structure and has the ability to be the most mobile joint in the body. For those with a shoulder injury or degenerative problem, it can also become the stiffest joint in the body and the source of extreme life-changing pain. If you are experiencing shoulder pain, take action now and call the practice on (08) 6150 8785 (Scarborough) or (08) 6150 8783 (Mount Pleasant). Shoulder joints are almost constantly in motion during the day, enabling us to lift shopping or our children, play sport, swim, drive the car, tend the garden or do our jobs – don’t risk the problem getting worse and spoiling the enjoyment of everyday living that we normally take for granted. There are nine muscles that cross the shoulder joint and a further six are closely associated with it. They can all potentially be involved in creating shoulder pain. 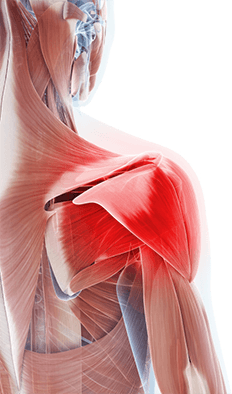 Numerous “bursas” (small fat pads) between muscles, tendons and bones in the shoulder are open to getting inflamed and painful through poor neuromuscular control of shoulder muscles that causes some to become weaker or tighter than other muscles. Decades of this mechanical imbalance can often lead to “wear and tear” of the shoulder joint. This takes the form of bone spurs, bursitis, muscle tears, loss of joint space, etc. These common problems are “red flags” that indicate that a functional neuro-muscular imbalance is likely to have been present for a considerable amount of time. A thorough examination of the tone of each of the muscles in the shoulder, (not just the rotator cuff muscles) is vital to establish the exact requirement and treatment so the patient can be pain-free and return to maximum function. For each patient, the exact tone of all the shoulder muscles is established on the first Spine Scan consultation and they are tested and reviewed each visit thereafter. Combining the “Spine Scan and Trigenics” systems will immediately address the muscle problems that are creating the imbalance within the shoulder joint. Weak muscles are strengthened, and tight ones are lengthened to restore balance once more. If you have any of the following symptoms, please do not delay in seeking treatment. Anti-inflammatory medications, heat pads and ice packs can help – but they do not address the cause of the problem. Because there are so many common causes of shoulder pain, you might need very different treatment than someone with similar symptoms so it is vital to get the correct diagnosis and treatment as early as possible for a speedy recovery. The longer that “normal” neuromuscular tone within the shoulder is maintained, the better the body will be able to heal and provide long-term results!